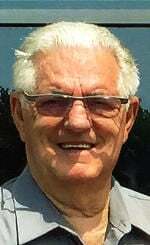 Edgerton, WI -- Roger F. Deets, age 77, passed away on Thursday, April 11, 2019, at St. Mary's Janesville Hospital. He was born in Rockford, IL on August 10, 1941, the son of Foster and Edna Marie (Bartles) Deets. Roger served his country in the U.S. Air Force from 1964 to 1967. He married Shirley Learned on November 9, 1991 in Janesville. He was a member of the Iron Workers Union #498 out of Rockford. Roger is survived by his wife, Shirley; son, Roger F. (Deanna) Deets, Jr; daughter, Joy (Les) Hanson; three stepdaughters; 13 grandchildren; four siblings; and many other family and friends. He was preceded in death by his parents.